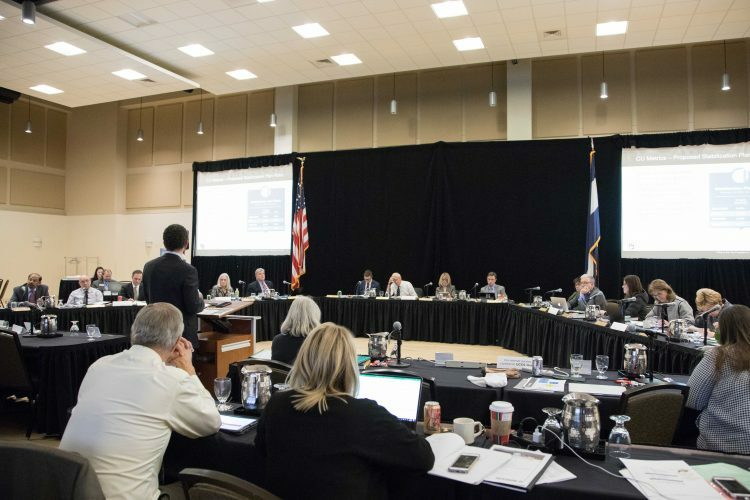 Board of Regents meeting from November 2018 at UCCS. The nine members of the University of Colorado Board of Regents will meet in regular session Feb. 13-14 at CU South Denver. The regularly scheduled meeting will include public sessions open for faculty, staff, students and community members to observe. The Regents will meet in executive session at 9 a.m. Feb. 13 before the public session from 11 a.m.-5:30 p.m. The board will return to executive session Feb. 14. Approval of new bachelor’s degree program in human services. Construction approvals for Spine Road construction and set shop building. The public sessions will include reports from system governance groups, metric reports from each campus, a preliminary 2019-20 budget presentation and discussion and action items on civics literacy. The University of Colorado Board of Regents are elected officials charged with the general supervision of the University of Colorado and maintain exclusive control and direction of all funds and appropriations to the university. There are seven Regents elected from each of Colorado’s congressional districts and two elected from the state at-large.